Want to change more lives than just your own when you level up with a new home? It’s easy – each Vow2Save website already has a give back feature built right in! Simply specify a link to your charity or 503c3 of choice when you create your website. 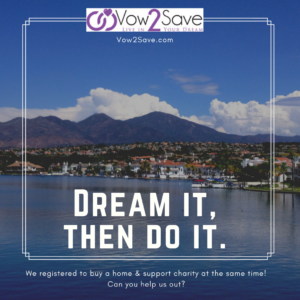 Once you earn that down payment and close on your new home, Vow2Save sends a contribution in your name to your charity – it’s that easy! By the way, Vow2Save is free to everyone who uses it. Funds are only exchanged IF you close on your home, and that’s from your Realtor. They pay a small ‘referral fee’ that helps keep the program running smoothly and your contributions flowing down to deserving nonprofits. You get to choose any Realtor and lender you’d like, or we can set you up with someone trustworthy & cool through our Young Professionals Network.